Teenagers: to work this summer or not to work? 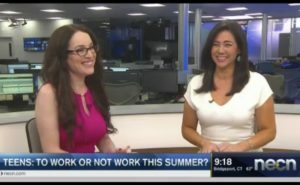 That is the question, and my most recent on air discussion during my regular bi-weekly appearance on NECN with anchor Joy Lim Nakrin, where I share analysis and tips on timely topics through my lens as a Psychotherapist/Family Therapist. My answer: oh yes! There is much value for a teenager to work over the summer, which absolutely includes mental health. 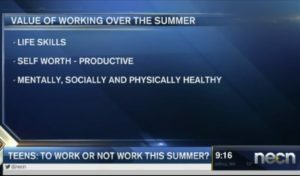 If you missed this live interview, check out the why and the what for summer jobs by viewing it now: Teens and the value of working over the summer.